In the 1950’s, the big auto manufacturers, and small private shops, one of a kind show cars. The essence of these creations would often show up on future production models. The style was influenced by America’s preoccupation with space exploration and penchant for low, long and sleek automobiles with abundant chrome. The talented designers of these show cars often became household names. America On Wheels celebrates these timeless beauties and the artisans who created them. This gallery features an array of vehicles that have a special relationship with their owners and the communities in which they reside. From hotrods to sports cars, from emergency vehicles to unique forms of personal transportation, each of these vehicles hold a significance all their own. 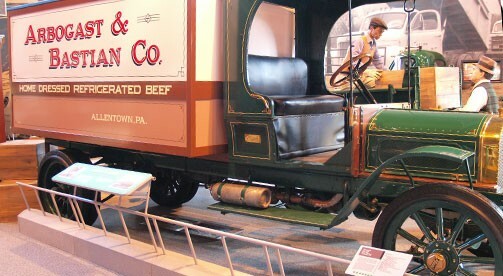 In the interactive exhibits, learn the stories behind the other exhibits in the museum, have your photo taken in the driver’s seat of a mini-Indy racecar, test your knowledge of auto-related locations in Allentown, and learn how Mack Truck’s uses their specialty vehicles to strengthen our communities. This gallery features vehicles used for personal transportation spanning over a century. Here you can view many of America’s “first” in automobile history, such as one of the first American cars every made, an early electric car, and the first type of car to be made by methods of mass product. You can also see some of the most recent options for versatile transportation available today that get you out of the car and on the road! In the interactive exhibits, be a sleuth and figure out who actually built the first automobile, try to figure out just what the differences are between a car and a carriage, learn about how we might fuel our vehicles in the future, and even design your own car! This gallery features several examples of the extensive array of trucks produced over sixty-eight years by Mack Truck, Inc, including one of the first models with an enclosed cab. Also included in this gallery is an extensive collect of bikes, both motorized and self-propelled. In the interactive exhibits, practice driving your own Mack truck, find out what type of vehicle you are most naturally suited to, test your knowledge of auto tools and their functions, hear audio of actual Mack employees and truck drivers talk about their experiences, and much more! A special thank you for The Charter school for doing this special painting project in our Auto Art Gallery!